How to use two-step login with Office 365. Starting February 27, 2019, Office 365 will become protected by two-step login for most users. Office 365 includes OneDrive and Sharepoint, as well as the online versions of Outlook, Word, PowerPoint, Excel and other applications. If you've already registered for two-step login and have enrolled devices, you'll be prompted to complete two-step login. This functionality includes a "Remember me for 7 days option." See image below. If you have registered for two-step login, but not enrolled any devices, you'll re-directed to enroll your device(s). Access will be denied until devices are enrolled. If you have not registered for two-step login at all, you will effectuate your login process as normal without being prompted for two-step login. (And before you ask, if you're already registered for two-step login, you cannot request, and will not be granted, an Office 365 bypass). 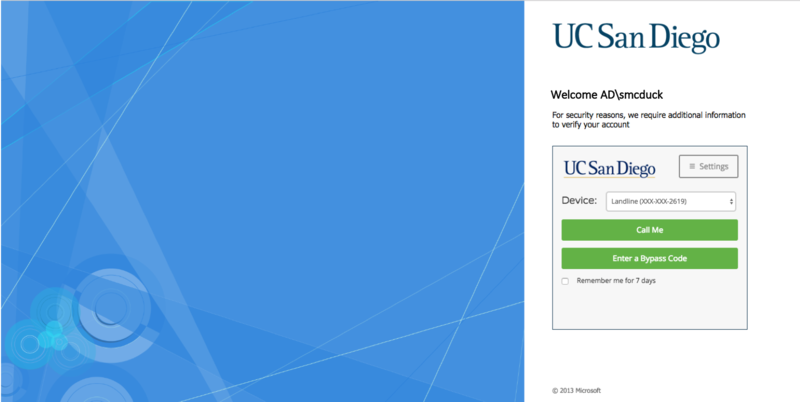 If you are a UC San Diego Health employee and currently use campus' instance of Office 365 as described above, you will be prompted to use two-step login for authentication. Please note: Health Information Services plans to roll out Office 365 to Health employees later this year, and currently requires two-factor authentication (2FA) using the same Duo app as campus to access the Clinical Web Portal. Stay tuned for Health-specific information on additional efforts to secure both employee and patient information. For more information, contact servicedesk@ucsd.edu or 858-246-4357.